Allow your business to run smoothly and efficiently with specially designed self inking stamps from TEKSOFTPRINT. Self inking stamps are perfect – they have the convenience of not needing an ink pad and are small and compact for office use. 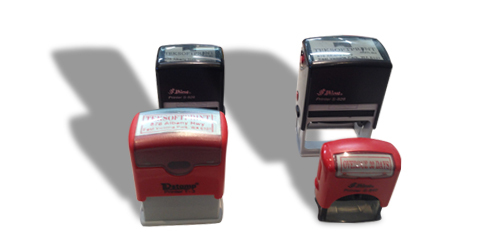 Self inking stamps are a great way to keep on top of accounts, invoices and statements. However they can also be used to provide your contact details quickly and efficiently to customers- used for such things as letters, bills and mail saving valuable time in hand writing out contact details. TEKSOFTPRINT self inking stamps are a fantastic inexpensive way to personalize your business stationary and documents. There a range of sizes available in our self inking stamps and you are able to choose from the color of ink you wish to use from red, blue or black. If you would like more information our excellent self inking stamps please do not hesitate to contact us our friendly staff at TEKSOFTPRINT in either of our conveniently located stores in Victoria Park or Midland.